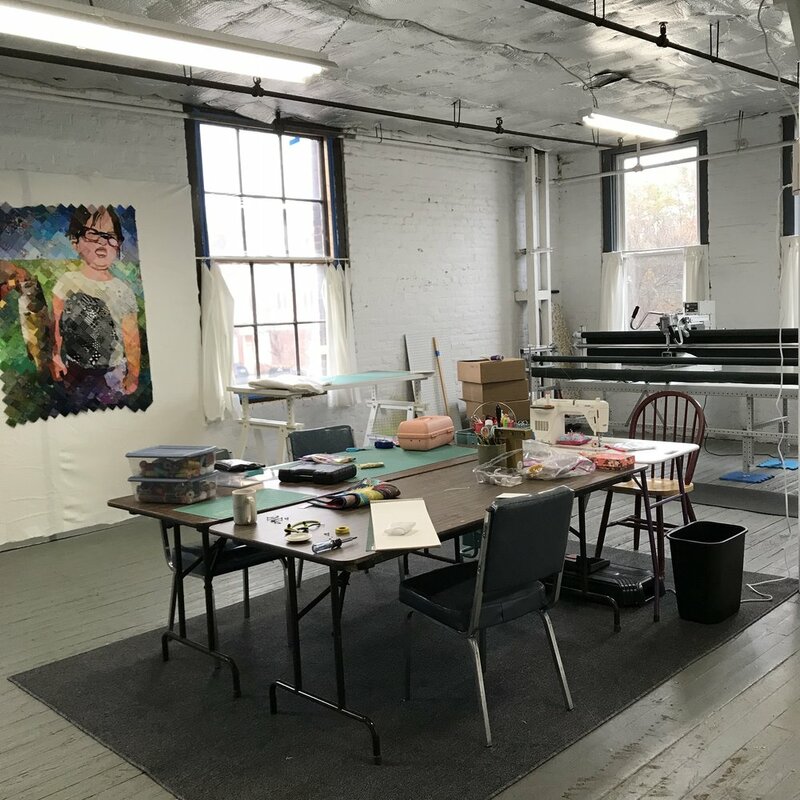 This month I moved all of my quilting supplies into a *real* studio in Holyoke, MA. I have worked from home for 15 years, and it's been the perfect situation for me most of that time. Recently though, I have been feeling stifled. My quilting world and personal life were constantly intertwined. There was not any space to breathe around either entity. An 800 square foot space became available a mile from the house and I made the big leap and leased the studio. It has 5 large windows, and I now have 2 giant design walls, which really is a dream come true. It’s a nice to walk over one of my recent inspirations, the Connecticut River, to get to work. Stay tuned for an Open House invitation! I hope that literally having room to spread out will metaphorically help me grow as an artist. I know I already feel better about leaving the house to go to work. Another bonus: this weekend we had house guests. Everyone ate breakfast together at the big dining room table since there weren't piles of quilting supplies taking over every surface. Right now I am reading Write Naked: A Bestseller's Secrets to Writing Romance by Jennifer Probst. Reading what writers have to say about the creative process always inspires me. As I read, I substitute words to relate to the quilting world. Write and writing become quilt and quilting. Readers become viewers. Manuscript becomes work-in-progress. Finally, I fell into a routine, discovering the schedule that worked best. Some writers (quilters) go by daily word count (block count). Some by the time spent actually writing (quilting). You need to find what works best for you, whether it's an ambitious morning schedule and flexible afternoons, or vice versa. But you must treat your writing (quilting) like a job. As Nora Roberts says, "I'm the hardest boss anyone could ever have. My boss is giving me a few days off to eat some turkey. I hope you all have a very Happy Thanksgiving. My 2018 teaching and lecture schedule can be seen here. As I firm up details, I'll be adding several events over the next few weeks.